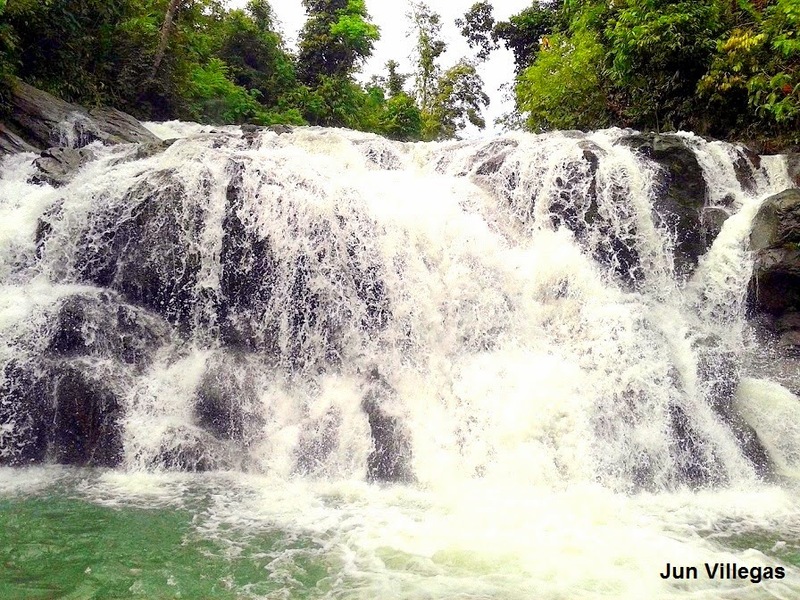 Mindanao is blessed with having numerous waterfalls. In fact, should there be an official listing of the top ten falls in the Philippines, Mindanao will get more slots since it boats of the following falls, namely: Asik-Asik Waterfalls and Bani Falls in North Cotabato; Maria Cristina Falls, Cathedral Falls, Limunsad and Tinago Falls in Lanao Del Sur; Aliwagwag Falls and Campawan Curtain Falls in Davao Del Norte; Tinuy-an Falls in Surigao Del Sur and the Maragusan Falls of Compostella Valley. 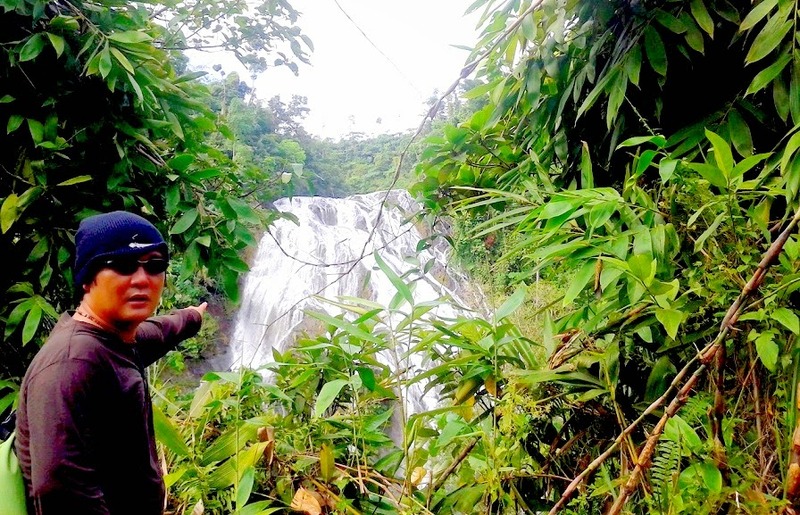 But there is another one which a traveler, blogger, adventurer, waterfalls chaser or a simple tourist should see before he dies, and that is the Awao Falls of Monkayo, Compostela Valley. From Davao City, take either the Bachelor Bus, Metro Davao Shuttle or van ride to Monkayo.. The bus ride is good for 3 hours. Fare in the aircon bus is P140. In Monkayo, you have to rent a skylab towards the falls. From Butuan, ride the bus going to Davao and the bus ride is good for 3.5 - 4 hours, then alight in Monkayo. You can choose from the following lodging establishments, namely: Rayous, JRC and Jovir. I was billeted in Rayous (Contact Nos. 0943-130-2752 / 0917-723-5753) . The cheapest aircon room is P600.There are other rooms at the price of 700 and 1,000. But they have non-aircon rooms for backpackers dormitory room at the price of P180/ head. You have to rent/charter a skylab ride towards the falls. Considering that the road is extremely rough, perilous and muddy (during rainy season) and from the town it is more than 18 kilometers, the P400 price is not that expensive. I was in Mindanao chasing waterfalls. And the town of Monkayo was the last stop before going back to Manila. I was looking further for an adrenalin pumping adventure and I got it here in Monkayo! The Skylab ride towards the falls is a bit dangerous, uncomfortable (at times) and physically draining but it's all part of my adventure here in Monkayo. I will not hesitate again to have this experience. Going towards the falls, there was only one passenger but along the middle of the journey, we stopped at Mamay's former house and he asked for companions towards the falls. It was a lot easier for him having 3-4 passengers rather than having only one passenger. He had to balance the skylab and I was a bit heavy for the ride. After an hour, we reached the residence of Barangay Captain Moises Bacolod of Barangay Awao (Contact No. 0948-897-2495). Coordination with the barangay is a must and the barangay provided me with a tour guide (Price is P100-200 according to your own discretion, I gave P150.00). The name of my tour guide is Noli Iyana (he has no phone). From barangay hall, we had to cross the river and travel for another 15 minutes or 4 more kilometers before reaching the jump-off point towards the falls. Finally, after 1 hour and 15 minutes from the town of Monkayo, we reached the jump-off point. There is an entrance fee of P15.00 but I did not pay since there was nobody on duty that day. From the jump-off point, you can already see the falls. According to Noli, the tour guide, there are a total of 3 falls and our first destination is Falls No. 1. The descending trek towards Falls No. 1 is good for 15 minutes. But since it was muddy and slippery that day (thanks to Typhoon Seniang), I was able to reach the falls in 20 minutes. Mid way of the trek, the presence and the might of the falls can be heard and the size of the falls can also be seen. And what a sight it was! After 20 minutes, my effort was rewarded with the beauty, splendor and grandeur of the falls. Behold Falls No. 1 of Awao Falls! Honestly, I do not know how tall and big is the falls but based on this picture, you can have an idea on how big the falls is. Noli was dwarfed by the size of Falls No. 1.
. Falls No. 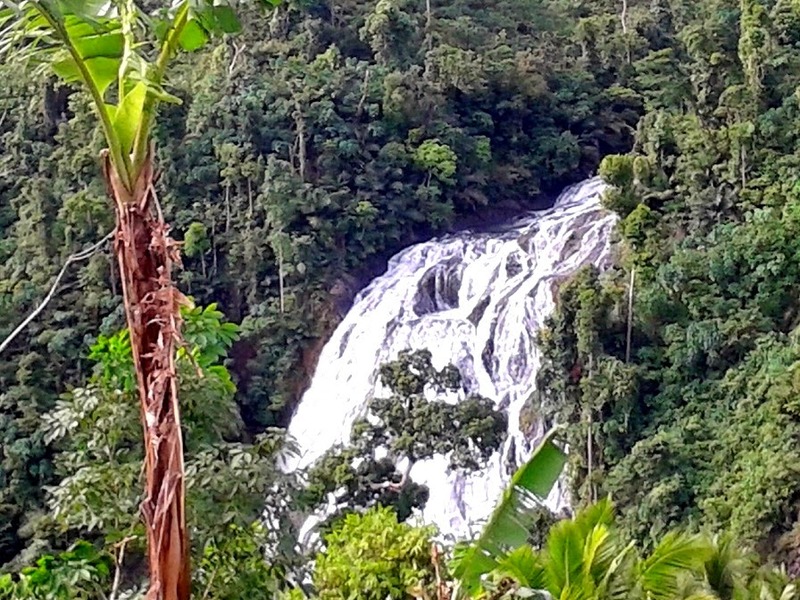 1 is the tallest and biggest among the three falls in Barangay Awao. Even my companions were amazed by the size of the falls and they could not help themselves from staring at the falls. After taking some pictures and videos, we climbed back towards the jump-off point and headed towards Falls No. 2 and 3. According to Noli, there is a passage in Falls No. 1 leading towards Falls No. 2 and 3 and the trek was more than 30 minutes. The trek towards Falls No. 2 was good only for less than 5 minutes. Falls No. 2 of Awao Falls reminded me of the numerous falls in Laguna. After seeing Falls No. 1, I was no longer excited to see Falls No. 2 since Falls No. 1 is taller and bigger but the nonetheless, the shape of the falls captured my attention. I thought the fun and adventure ended in Falls No. 1 until my guide told me that we have to climb Falls No. 2 itself in order to see Falls No. 3. I told myself this guy must be out of his mind, imagine the path! I asked if there was another path towards Falls No. 3, and I was told that it was the only one. Again, another buwis-buhay (death-defying) adventure for me! It's December 30, 2014 and it will be New Year, the following day and I convinced myself, "You can do it!" With all the strength and courage, I climbed but I was very careful. One mistake and I will fall and I will be taken by the strong current of the falls and who knows if I will survive or not the fall! After more than 15 minutes, I reached the top of Falls No. 2 and was surprised to see the curtain falls of Falls No. 3! The sight of the falls was enough to compensate for the effort, pain and sacrifice in climbing the falls. Going back, I saw skylabs carrying timbers from the forest and I was shocked on how these skylabs could carry the weight of the timbers! After reaching the barangay hall of Awao, I paid the guide and my other companions also alighted. And this time, Mamay loaded the skylab with other passengers. I did not complain for two reasons; first, there was no other mode of transportation for the locals and second, I want to experience it. According to Mamay, the maximum passenger of the skylab is 8-10 passngers. But there was a total of eleven passengers! Yes, 11 passengers onboard the skylab going back to the town of Monkayo! The Skylab experience, the long and winding rough road towards the falls, 11 passengers, and the sight of the 3 falls were MORE THAN ENOUGH for the adventure that I was looking for in Mindanao! It has been almost two months and I have not blogged the Hong Kong trip and while here in Baganga, Davao Oriental, I promised myself that I will finish it today. I was given only three days stay in Hong Kong and on my second day, I went to Disneyland. Honestly, I did not enter Disneyland because I find the 300 HKD quite expensive. I roamed around for half an hour and went to my second destination. And this one was more exciting. From the station area of the cable car, I chose my own tour which included four (4) destinations with a tour guide and I paid 360 HKD. After paying, I immediately boarded the cable car going to Lantau Island. It took me less than an hour before I reached the Ngong Ping Village. First stop of the tour was the Old Fishing Village. Thereafter, we boarded the traditional Chinese boat and went whale watching. And after only 10 minutes, we spotted the famous white whales. After the whale watching, we were given 45 minutes to roam around the island and we did! The Old Fishing Village experience is one of a kind! We went back to Ngong Ping Village for our final destination. The second biggest Buddha in the world. One has to make an uphill trek to have a closer view of the Buddha. And you have to be physically prepared for the long and tiring ordeal. It took me only less than 20 minutes before I reached the peak and I was gasping for breath. I am no longer use to climbing, maybe I am getting old already. And finally, the second biggest Buddha. We had to ride again the cable car going back to the mainland. It was my second time to visit Phuket, Thailand. The last trip was November 2013 or about a year ago. But this time I have only two (2) days to spare for my tour and I had to maximize the trip. I arrived in Phuket from Singapore past 10 am and the first thing I did was to go to Phuket Town and checked-in at Sino Inn Hostel. I was supposed to arrive a day before my actual check-in but thanks to the change in the schedule of the flight, I had only 1.5 days to roam around Phuket. I paid only P1,200 for my two (2) day accommodation. At the front desk, I booked my two (2) tours which consist of the James Bond Tour and the Phuket City Tour. I booked my city tour 3 pm so that I could still take a nap before the actual tour. I paid 750 baht for the tour which was arranged by Sino Inn. And the tour was good only for four (4) hours. I was fetched from the hotel by the car service and our first stop was Wat Chalong Temple or Chai Tararam Temple. Wat Chalong is about 8 km south of Phuket City. It is the most important of the 29 Buddhist temples in Phuket. It is the largest Buddhist temple with stunning architecture and the most visited among all the temples in Phuket. After staying in the temple for less than 20 minutes, we sped off towards our next destination. Good thing my driver/tour guide speaks good English. He was able to explain to me some important things/details about the places and the tour itself. After 10 minutes, we reached our second stop for the day. The cape is located at the southernmost tip of Phuket and is one of the most visited places in Phuket. Also known as Phrom Thep Cape or Laem Promthep, it is considered one of the most beautiful spots in Phuket. Notably, it is the best spot in Phuket to watch the sunset. After taking some pictures at the Cape, we went to our third destination - Karon View Point. From this spot, you can see the Kata, Kata Noi and Karon Beaches. It was already 5 pm when we were nearing the beaches and I decided to satisfy my hunger. I asked the driver the best spot for our meal and he took me to Baan Chom View Restaurant. It is located at Kata Beach. It is ranked 35 out of 109 restaurants in Phuket. It serves a variety of dishes. The view for the restaurant was enough to satisfy my crave for my late lunch but I still wanted to eat and taste the food per recommendation of TripAdvisor. I ordered for both of us (driver/tour guide and I) and we ENJOYED our late lunch! Hooray for Baan Chom View Restaurant! Afterwards, we went straight to our fourth destination - Kata Beach! Along the way, we stopped at another beach - Karon Beach! But my personal favorite is the world-renowned Patong Beach! I walked the entire stretch of the beach and watched the activities and the sunset at this spot. The trip to Patong Beach will not be complete without going to the famous nightlife district of Bangla Road. Last stop for the day was the Sino-Portuguese Houses at Thalang Road at the heart of Phuket Town. Your Phuket City tour will not be complete without dropping at this side of Phuket Town. And the best time to visit it is at nighttime when the beautiful colors light the road. And the 4-hour tour was coming into a conclusion. Finally, ending the day with a Thai massage at Rain Tree Spa of Sino Inn Phuket Hotel. And what a relaxing massage to end a very tiring and exciting day in Phuket.